Since these babies aren't your everyday tomato, I'm sending them to Marija of Palachinka, this week's host of the ever-popular Weekend Herb Blogging, created by Kalyn of Kalyn's Kitchen. I love how you take photos of the lovely tomatoes. Looks great for a summer dish. Oh, I can just imagine the spectacular dishes those tomatoes would make (plus, the names sound so Lord-of-the-Rings-y, so that's a plus)! The pasta's so fresh and gorgeous. Wow this looks gorgeous! I've never seen baby heirlooms before but now I definitely need to keep an eye out for these. I bought a strawberry basket of baby heirloom's yesterday at our (Santa Monica) Farmer's Market for $3.50 - they work better for us (than their $4/lb huge brethren) for our small family as I'm the major tomato lover and it's hard for us to finish one big one but can easily use the smaller heirlooms all week long. I love your recipe! Yum! Susan I hear you! I "heart" tomatoes and this recipe using the heirloom variety is absolutely perfect...great flavour combinations yet again! I TOTALLY wish I'd read your post before dropping $7.50 on two heirloom tomatoes yesterday at the farmer's market!! Baby heirlooms would have worked just fine for me :-) Your pasta came out just lovely! 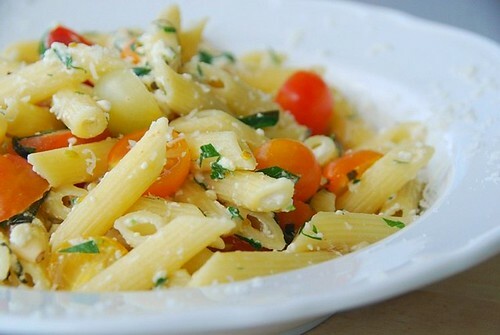 Your pasta dish looks fresh and summery and absolutely delish. An heirloom preparation Susan, stunning & beautiful as ever. Love the little ones in every shape possible. How funny it is...here we either get tomatoes or we don't!!! I love the choice of stuff you can pick up...& am glad you make the most of it!! 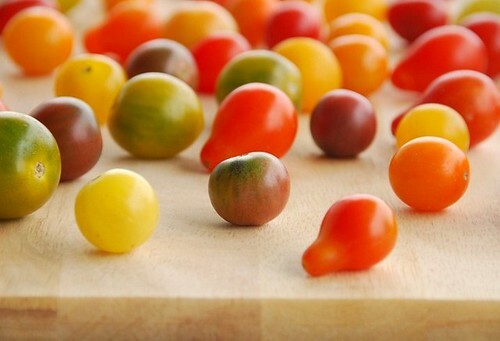 Such exquisite and cute little tomatoes! That dish is gorgeous! Those are the most beautiful tomatoes I've seen. And pasta, cheese and tomatoes sound and look delicious. What gorgeous little jewels! And what a wonderful recipe to feature them, Susan! Looks adorable...those baby heirlooms. love how they liven up the pasta too! The nasty heat of summer (you remember what an east coast city summer is like, right? I'm NOT bitter, not really!) is entirely justified by tomatoes. Real tomatoes. Heirlooms and Jerseys. And lord, your pasta looks delicious! 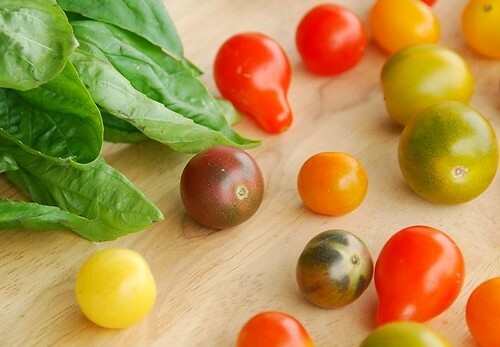 Our overgrown tomato plants might not produce heirlooms, but we have too many cute grape and cherry tomatoes to skip this fresh and delicious looking recipe... can't wait to try this - I'll grab some fresh chives and basil from my herb garden on the way in! Not to mention, ANYthing with toasted pine nuts is a winner in my book. YUM! Oh my goodness, Susan... AMAZING! My mouth is totally watering. Your photos are top notch. Yum. That's all I got. Just yum. Those little tomatoes are just too adorable! Beautiful pictures too! Tomato's best friend, basil. Cute! That dish looks so fresh and inviting. What a colorful and cheerfull post this is! This is such a pretty batch of pictures, and the picture of the finished dish makes me instantly hungry. Beautiful! I keep a bowl of cherry tomatoes on my counter too and it's one of my favorite (constant!) summer snacks. My favorite heirloom cherry tomato is called black cherry. I've grown it the last few years but didn't find plants this year. And those little orange sungolds (which I don't think are heirlooms but are super sweet and delicious) are another favorite. You know, I don't think I've ever actually tried an heirloom tomato before. But I do have a surplus of garden tomatoes right now. I'm picking hundreds of sweet 100s a week right now, and I'm betting they would go perfectly in this dish! heirooms are as easy or difficult to grow as other tomatoes. i really don't understand why they are such a rip off. Here we have only the red once and they are really expensive. I remember when I was little my grandfather grew tiny tomatoes and they were sized of a marble. I found them on the net, they are called red currant tomatoes. Unfortunately, we lost the seeds over the years and I've never seen them on the markets :(. I've been waiting to see some of those beautiful multicolored little tomatoes in my local farmer's markets for just this purpose. I want some pasta with little multicolored tomatoes so badly! Reminds me of a song "There's only two things that money can't buy - and that's true love and home-grown tomatoes"
Those look wonderful! The new area we're moving two has lots of local markest which I'm really looking forward to - And it's the main tomato region for France! Oh... Your pasta looks to be the perfect showcase for them! a perfect Italian paste, between my preferred ones, compliments always has of the good plates, kisses! mark-Lord of the Ring-y, huh? Maybe that explains why Jeff loves them so much. amy-Oh, please do. You won't be disappointed. sarah-Exactly. That's a reasonable price too, especially for such a wonderful fm, like SM. Glad you like the pasta too. marc-Ooh, your pasta sounds heavenly. deeba-We are fortunate to have such a wonderful array of beautiful produce. elly- :) Now, that's a good comment. ann-You said it! When you bite into a juicy tomato, times slows down, doesn't it? shn-That'll be exciting-- learning a new market and meeting new people! kara-That's so cool that you can just go into your yard for veggies and herbs. Enjoy! bee-I think it's like most things--it's all about the packaging. And they've got some good-looking packaging. marija-Redcurrant tomatoes, huh? How funny you should mention that, because yesterday one farmer had the tiniest tomatoes I had ever seen. I wonder if that's what they were. I would frame those and hang them in the kitchen~ they are gorgeous! I am green -- and striped, and yellow, and red, and purple -- with envy! We never see baby heirlooms at our local farmers market; I have to go so far afield to find them that it almost doesn't make sense to make the drive. And yet, eating baby heirlooms is like eating candy! Love the picture of the colored tomatoes! You photograph pasta so well, I am sure they taste even better! Simply beautiful. Ricotta is one of my favorite cheeses. I'm hungry right now. Those are darling tomatoes...didn't know heirlooms grew in baby size. 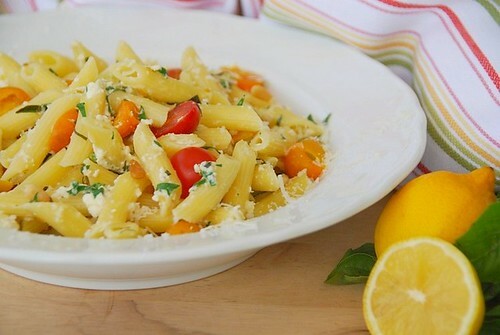 The pasta dish is so perfect for summer...herbs, tomatoes, cheese, YUM! i simply need to eat more heirloom tomatoes. just recently, fine cooking magazine (if i'm not wrong) had an article about heirloom tomatoes, i saw lots of green zebra tomatoes everywhere in food bloggers' blogs. What a beautiful looking pasta. Those tomatoes are just perfect. I can just imagine how yummy this is. Great pics! Another wonderful recipe! I am hooked on the heirlooms with all their wild colors and stripes, and fortunately can find the baby tomatoes locally. So far I have found that the larger varieties have more flavor and sweetness, though. I wish I lived near that market of yours Susan! Such a gorgeous dish, I'm eating it with my eyes! So what can I say besides, "can I have some?" I love all these ingredients and mixed together, this sounds prefect. I get all tingly when I find these little beauties at the farmers market. As it happens I just completed a salad with these lovelies....to the market again on Saturday!!! Those baby heirlooms are so doggone cute, who could resist? Susan, I love how fresh and simple this dish is. Perfect to let the tomatoes shine - they are so adorable! I've had those baby heirlooms from Trader Joe's--they're so fresh and delicious! And in a dish like this, they must really shine. It looks fantastic! I also buy these from Trader Joes, you just can't beat the flavor! And paired with the fresh ricotta, and basil, you can't get any better than that! Where's my fork!! The tomatoes and their colors are just beautiful and your pasta dish looks delicious!!! I love heirlooms! None of mine are ripe yet though, boo. annie-That's terribly kind to say. lydia-I wish I could share some with you. michelle-It's perfect in pasta, isn't it? eliza-I love green zebras; they have a wonderful citrusy flavor. lynda-I think the larger ones have more variety of flavor for sure. val-I love the weekends for the fm's! elle-They are good, aren't they? marie-You better go get it! 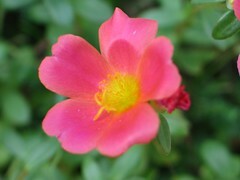 kalyn-But you'll have them in your own garden! fresh, simple and absolutely delish! pasta always tastes perfect with fresh ingredients. Susan, lovely colorful pictures! That is such a fresh and simple meal, perfect for those busy summer days! You take the BEST pictures of food, Susan. I'm always hungry after I visit your blog. I just put baby heirlooms on my TJ's shopping list. that looks amazing! the simple dishes are so often the best. This dish looks so yummy. I can't wait to prepare it for my family. What great little tomatoes. We never see the little coloured ones here, just red or maybe yellow. This looks delicious - the perfect recipe to highlight the flavours of summer. Thanks!